If you ever wanted Public Health Service scientists to have strong whistleblower rights, it would be now. In the face of an Ebola epidemic in West Africa, 65 PHS medical staffers have agreed to assist in combatting this frightening disease. On the front lines to curb Ebola, and risking their lives to help thousands of its innocent victims, these physicians and healthcare providers are part of a PHS corps that includes more than 6,500 scientists working at more than 20 federal agencies. (Those agencies include the Centers for Disease Control and Prevention, the Food and Drug Administration, and the Environmental Protection Agency). They should be free to express their concerns about any aspect of the federal Ebola effort. However, their whistleblower rights are not as strong as the rights of other federal workers. That’s because PHS scientists are under the jurisdiction of the military whistleblower protection system. The civilian system is far stronger. Ideally, whistleblower protections for all members of the armed services would match the protections offered by the Whistleblower Protection Enhancement Act, approved unanimously by Congress in 2012. But certainly those federal employees who are not soldiers and for years enjoyed civilian protections should not have to wait until military protections equal civilian ones. The reason for this state of affairs is complex, and there are no villains to blame. From 1978 through 2009, the PHS corps had civilian whistleblower protections. Court decisions challenged that arrangement. A whistleblower complaint was dismissed because the judge determined that a PHS whistleblower was not eligible to pursue a complaint under the civilian process. PHS workers found themselves in limbo. The way to fix the problem was for Congress to include language in the Food and Drug Administration Safety and Innovation Act of 2012 that clarified that these scientists may be on the front lines of disease and perhaps scientific exploration but they serve no combat roles. They should not be consigned to military whistleblower protections. But that didn’t happen. Sen. Chuck Grassley (R-IA), a strong defender of whistleblower rights, instead proposed an amendment that officially placed the PHS staffers under the jurisdiction of the military whistleblower system. At the time, there was concern that switching jurisdiction back to the civilian realm might in some way compromise some of the benefits that accrue to service in the Public Health Service. In reality, this is a non-issue. After all, PHS members had civilian whistleblower rights for 30 years without any erosion of their military status or benefits. Since 1994 employees of government corporations have had civil service whistleblower rights, without disturbing any other terms of employment. Things improved some for PHS workers when Congress strengthened protections for military whistleblowers in 2013. Those protections, advanced by a bipartisan team that included Senators Grassley, Mark Warner (D-VA), Susan Collins (R-ME) and Tim Kaine (D-VA) gave whistleblowers more time to make their case, and ensured that those judging their reprisal complaints were independent of the whistleblower’s immediate supervisors. But the protections are still not strong enough. Scientists, physicians and nurses in the Public Health Service still lack the ability to take their complaints about being harassed if they expose waste, fraud and abuse to court if they are not satisfied by the administrative process. Their “day in court” through administrative hearings is conducted by the military institutions that normally would be defendants, rather than an independent forum. And the legal standards to prove harassment and retaliation are stacked against them, based on rules dating back to the 1970s that have been updated in every whistleblower law enacted since 1989. Our PHS workers are first-class scientists and healthcare providers. They should not be consigned to second-class protections. While I agree that PHS Commissioned Corps officers deserve robust whistleblower protections, as do all service members, I think there is a misunderstanding regarding the USPHS Commissioned Corps. 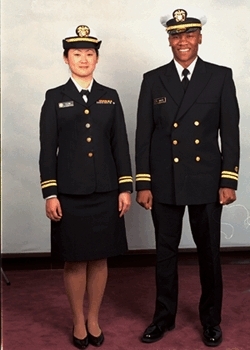 USPHS officers are not merely “workers” or “employees;” they are, by definition found in Title 10 of the U.S. Code, uniformed service members. Officers are nominated by and receive a commission from the President, serve at the times and locations required by the service, and wear the uniform of the service daily. This is the same for all uniformed services, and for this reason, all uniformed services have the same benefits and protections. We should instead focus on increasing whistleblower protections for all service members, regardless of whether they are part of DoD or part of DHHS.